November is here and the holiday is just around the corner. Around this time each year I take every chance I get to dress up for the holiday. Give me the metallic, the fur, the brocade, and all the sparkles because being glamorous is too much fun! I am loving my mint and gold outfit here. Vintage brocade shell top in the prettiest shade of mint with gold and bronze details, paired with a gold pleated skirt, and layered with a mint tweed blazer. I accessorized with the gold Charlie clutch by Kao Pao Shu (gold on gold because why not? ), classic black suede pumps from Sole Society and The Emerald City necklace by 31 Bits. 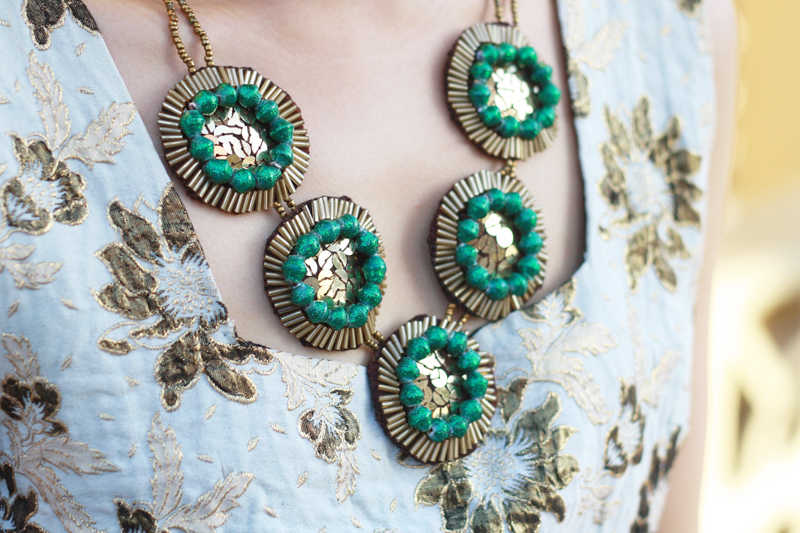 This beautiful necklace is from the 31 Bits Holiday Collection which just launched today! Not only does 31 Bits have the loveliest selection of jewelry, it has the most fascinating story behind it. Everything is handmade by women in Uganda using recycled products, providing them with jobs and education to get out of poverty. 31 Bits is "using fashion and design to empower people to rise above poverty". What are you waiting for? Go get yourself some pretty jewelry for a good cause now! Vintage floral brocade shell top c/o Primarily Forgotten Vintage. Gold pleated skirt from F21. Mint tweed motorcycle blazer from H&M. The Emerald City necklace c/o 31 Bits. Charlie clutch c/o Kao Pao Shu. Such a cute outfit, I really love your mixture of gold and mint. Great! First off, you are stunning. Secondly, this is a fantastic cause!